I’ve lost rings down bathroom drains, wallets at the check-out stand in supermarkets. I even lost Calvin once on a walk. He gave me signs that he was sufficiently trained to obey me, so I let him off leash. I blinked and he was gone. The next thing I heard him baying like a coyote in heat. He found a hole in the fence and wiggled through to run after a hare. I called him, but he was deaf. He was camouflaged in a thicket of bushes. I called louder. Nothing. I couldn’t climb the fence without tearing my body into pieces. I kept calling louder, but I was getting nowhere. By then I was hoarse. Finally I found a gate, unlocked it and ran through it. I spent an hour running all over the park calling for him. A park ranger drove by and stopped. I told him I was looking for my beagle. Had he seen him? The ranger laughed. I wanted to swat him. He said he’d keep an eye out. Did I want a lift back to my car? Yes, please. I was exhausted and ready to sob. How was I going to tell my son that I lost his dog? When we pulled up to my car, the ranger laughed again. There was Calvin sitting on his haunches waiting for me. 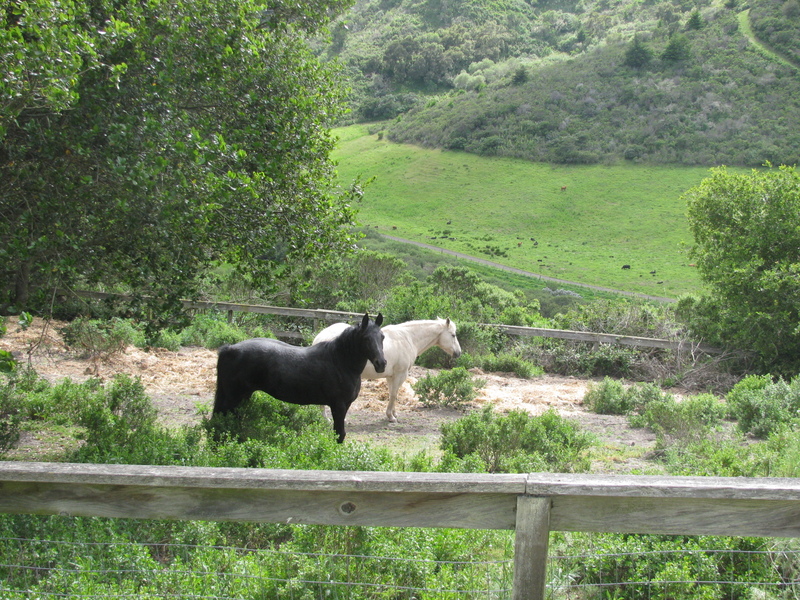 Alf and I took the back road through the mountain range from San Gregorio to Pescadero. The fog hung heavy this morning over the tree line. Small, brown rabbits with large ears and white cotton tails scurried across the road and disappeared inside the brush. Quail fluttered away. As we rounded the last curve and came down the mountain, a large field bordered by eucalyptus trees appeared on our right. Trailers, trucks, and SUVs were parked at the entrance. Inside, women sat in canvas chairs, each with a border collie by her side, watching a dog practice herding a flock of sheep. We had stumbled upon the Northern California Chapter of the Working Sheepdog Association. The woman in the middle of the field whistled her commands. Every whistle had a different tone. The dog was half listening. He didn’t obey on cue, and the sheep broke formation. He tried again and again and finally brought them as far as the enclosure, but his over-eagerness frightened them and they scampered in all directions. By now the sheep wore an afflicted look and the shepherd came to their rescue and called them back to the pen. If I were a border collie, I’d wouldn’t have the patience for all those whistles and stupid sheep. I’d take control and show them who’s boss. This particular dog, while he missed quite a few of the commands, was showing promise. The ones who demonstrate no aptitude for herding become household pets. That would be me again. I prefer the couch to all that exercise. Border collies are born with the herding instinct. Even as puppies they will herd a flock of sheep. As a pet, a border collie requires daily stimulus and exercise. If you have children he’ll herd them. Bunnies, ducks, kittens, even you. As I watched the action on the field, I thought about the handler. What if a dog knew more than his owner, but because he was under orders, he wasn’t allowed to shine? What if the owner didn’t improve? The dog would sink to his handler’s level of mediocrity. The opposite was true also. The handler could show considerable talent while the dog showed no inclination to learn. This failure would also reflect on the owner. In order to excel, it struck me that both dog and owner would need to be evenly matched. That would be the ideal partnership. I called my friend today. She said she was having jaw problems. She said she was out of pain, but her jaw was still clicking. “Isn’t that what it’s supposed to do?” I asked. “Can you make music with it?” I said. “No, and besides I have a nodule under my right earlobe the size of a large pea that’s not going away,” she said. “I didn’t know peas came in large sizes,” I said. “They don’t, but mine does,” she said. “Then color it and have some fun with it,” I said. “That’s a good idea, sorta like an earring, except a little farther down,” she said. “I still can’t gain weight. My friends tell me there’s something wrong. I don’t know. I eat like a horse,” she said. “You just can’t please anybody anymore. Thanks Hollywood. Those image-busters have ruined it for us. If you’re too thin, you’re not hot, if you’re too fat, you’re invisible. And if you’re just right, there are no real men out there to appreciate it anyway,” I said. She clicked and was gone.